Ankara Jazz Festival is far from being exciting for me especially in last three years. As someone taking flights for just one night concerts even to abroad, I, most of the time, do not want to join a single performance in my own city's festival. Poor and recursive line-up's are one side of this long story. The usage of shopping-malls as performance halls is on the other side and frankly it has nothing to discuss on, for me. So, to keep it short, I should say I can understand that the festival directors has not much to do since they do not have a main sponsor - at least this is what they say in general. However, this time, I could not believe my eyes when I saw Markus Stockhausen in the line-up. 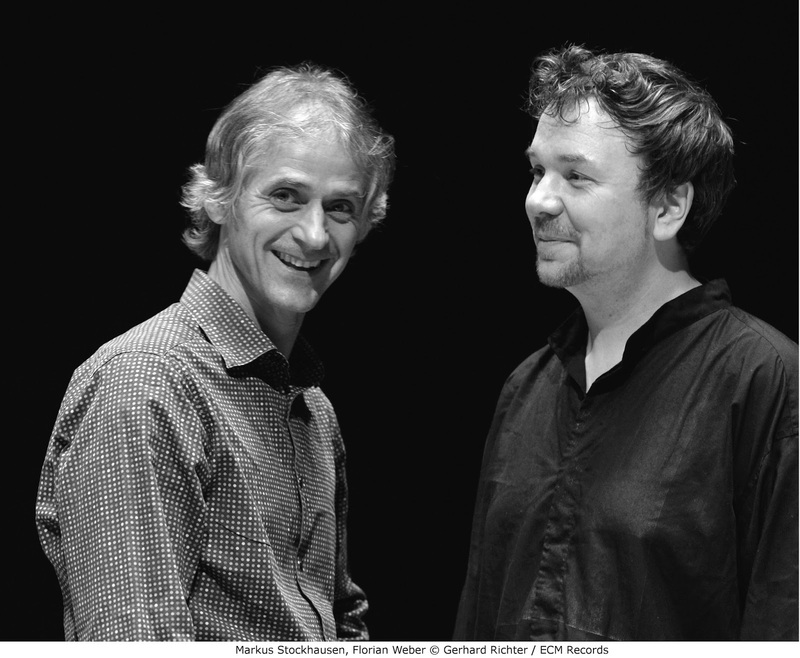 As a long time European Jazz follower, ECM collector and a fan of the album "Karta", I was really excited to see his name with his latest musical partner Florian Weber with whom we saw in one of the latest ECM albums, Alba. Having played for almost 6 years as a duo, they released this album on April 2016. The introduction piece of the concert started with no musician on the stage. We heard Markus Stockhausen's well known clean and touchy trumpet tone from outside the small performance hall of the museum whose two doors were looking to a large display room. 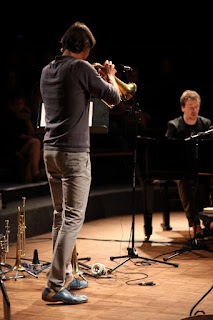 Florian Weber came silently and started to play his part while Stockhausen was still performing. Then his sound gets louder after the first 2-3 minutes as Markus Stockhausen enters the door at the back and passes through the stage. I was thinking during the concert that this introduction was about the concept of "Inside Out" but on talking with Markus Stockhausen after the concert, I realized that he had chosen to play some part outside, since his instrument needs a larger space than the hall supplies, considering frequency responses especially in high registers. They played some pieces from Alba such as Die Weise Zauberin, Befreiung, Emilio (a piece from Weber for his son - it is among highlights of the album with its naive aura), Better World (dedicated by Stockhausen to latest turmoil all around the world during the concert), Emergenzen and Mondtraum. Being consecutively located through the end of the set list, Emergenzen and Mondtraum were two impressive performances for me, especially with their catchy main themes and lyrical styles. Nicht Umsonst and Our father (from Stockhausen's 2004 album Joyosa) were among the other pieces performed. The last piece, Yahoo (a composition of Markus Stockhausen from 1998), ended as the first piece and Markus Stockhausen left the stage to the outside part of the hall to play the last. It was great to have experienced Stockhausen's classical music impressed spirit on jazzy and improvisational pieces in a live performance and I think Weber's collaboration on piano sounds very organic. The perfect timing and harmony between musicians even during the long pauses in some of the performances were really noteworthy. It was my first time with the pieces in Alba and frankly the compositions were very touchy and the way the duo play them is very much on the well-known ECM-style. I am sure it will take its well-deserved place in the legendary collection of the label among distinguished ones.